MEGACRA Fire-resistance Power Strip, necessary of your travel, home or professional workstation. The MEGACRA advanced surge protector provides premium power protection for your electronics from power surges, spikes, and AC contamination. 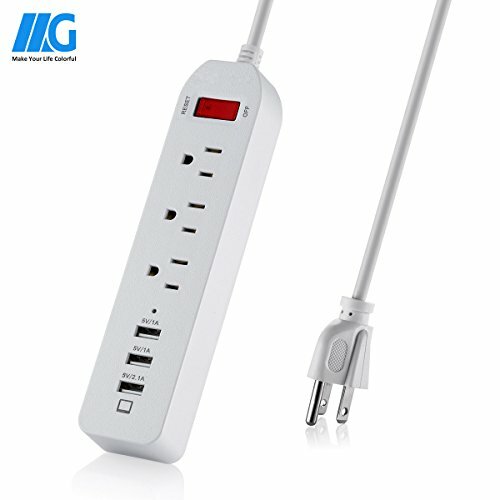 Advanced flame-resisting materials, fire-proof, water-proof, high temperature resistant 3 AC 3-prong grounded power strip with 3 charging ports. Built-in AC surge suppression shields connected equipment from damage and performance problems due to transient surges. 3 AC outlets 6-ft cord is perfect for desktop, network and home computing applications and travel. 3 USB charging ports for iPhone, iPad, Samsung, smart phone, tablet and other USB powered devices. All MEGACRA products are built to the highest quality standards and we stand behind our products with 30 day money back guarantee and a full 24 Month manufacturer's warranty. Certified by CE and ROHS. Fire-resistance PC shell make the quality and performance of MEGACRA-6AU6U guaranteed.